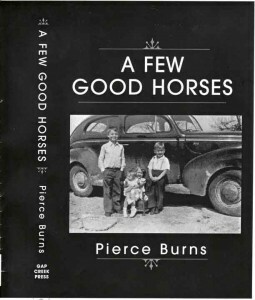 A Central Texas Family’s fight to survive the Great Depression as seen through the eyes of a young boy. West Texas is scattered with abandoned ranch houses and ghost towns. The people who live there and their life stories are fading–blowing away with the wind as buildings collapse and Western heroes die. 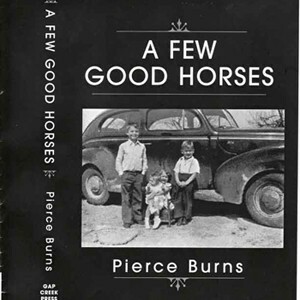 A Few Good Horses is a gritty account of early ranch life Texas from 1849 through 1935 as seen through the eyes of a fourth generation Burns boy. Simon Pierce Burns begins to secure his place in Brown County Texas history when he runs away from a troubled Ohio home in 1847. His sons, Simon Pierce Jr. and William Nelson, build a large Texas cattle ranch over a span of forty years. The author’s father, George Pierce Burns, quits his coaching job in the summer of 1929, starts a family, and begins ranching with his father and uncle. The family’s dreams change into a desperate struggle for survival with the onset of The Great Depression in Texas. Some family members are defeated by it, but others add their names to a lineage of heroes in Texas ranching history.